Being 200 km from Santiago, Villafranca del Bierzo is the closest point from which cyclists may begin the Camino to receive their “Compostela certificate ” in Santiago. (Those walking must walk at least 100 km to qualify.) This morning we watched group after group disappear down the road. We prefer being behind the cyclists as, although most do try to give some warning, it still startles and if the path is narrow walking pilgrims must move quickly off to the side. Today our walk was through the Valcarce Valley, very narrow with steep sides. The whole way we were crisscrossing the meandering Rio Valcarce and listening to it bubbling over weirs and special dam devices. “Valcarce” is so named because it’s steep walls are like enclosures or prison like. It is also an ideal spot for an ambush. Long ago pilgrims passing through the valley were frequently robbed by bandits or charged high fees by locals for safe passage. The Knights Templar were dedicated to keeping pilgrims safe wherever they travelled. As evident by their many castles, they became a welcome presence to pilgrims on the Camino whom they protected. 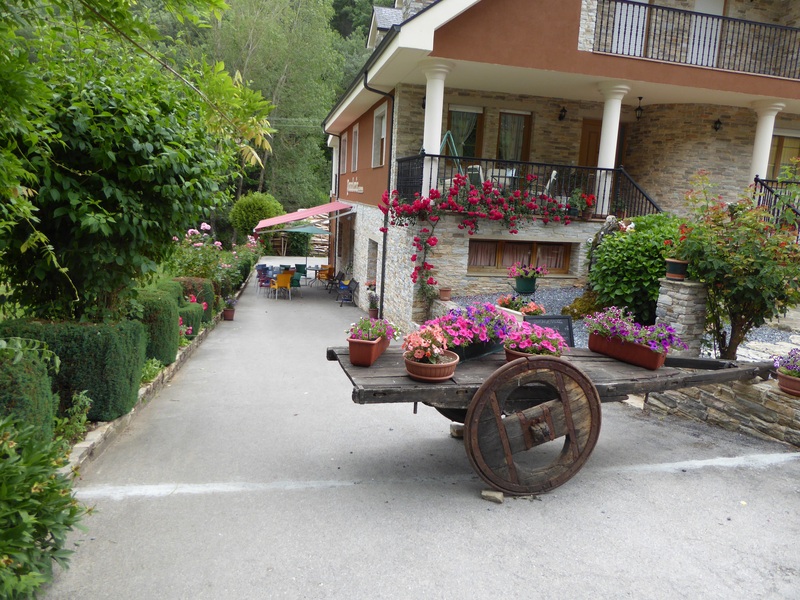 Las Herrerias ( aka Las Ferrerias), “The Blacksmiths” was so named as iron was mined in the surrounding hills and smelted on the river bank in the Middle Ages. Apparently in the early 20 th century there was also a steel mill here. Note: To add to the confusion of travellers, there is another Las Herrerias just a few kilometres before this one……? Now the main industries are agriculture –cattle farming, growing chestnuts, and a little logging. The local sawmill we passed had one man working and many piles of unsold lumber– very weathered as though they had been there a long time. 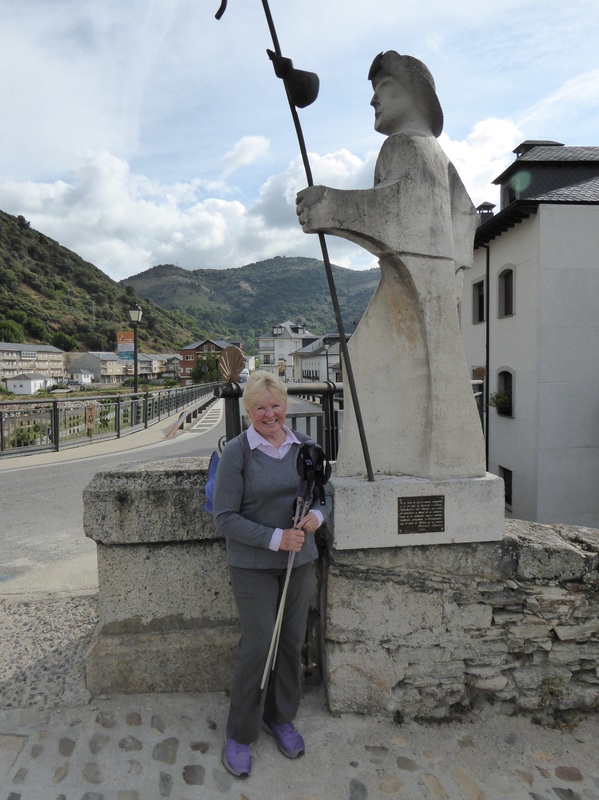 The Camino pilgrims are also a source of income for all the towns along the way, but this is very seasonal. We are seeing fewer pilgrims than we had expected on this part of the Camino for this time of year. Perhaps, the whole world financial situation has affected even pilgrimages. 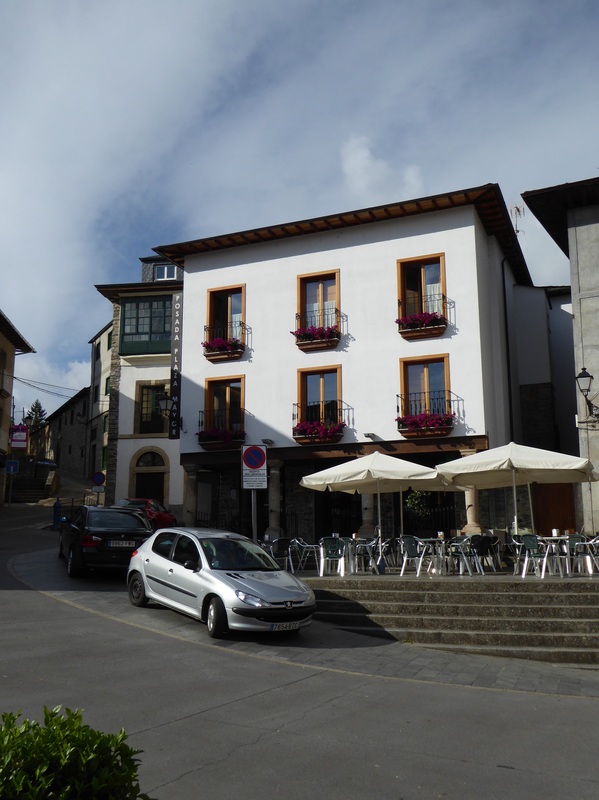 The Posada Plaza Mayor, our resting very comfortable resting place in Villafranca. Showed you the view from it yesterday, here is it from the street. Wouldn’t normally show our hotel, but this is so typical of our accommodations. Probably cost about $80 including a full and really nutritious breakfast. So very friendly and helpful staff, just like most others. Buildings along the road in the valley bottom leading out of Villafranca. 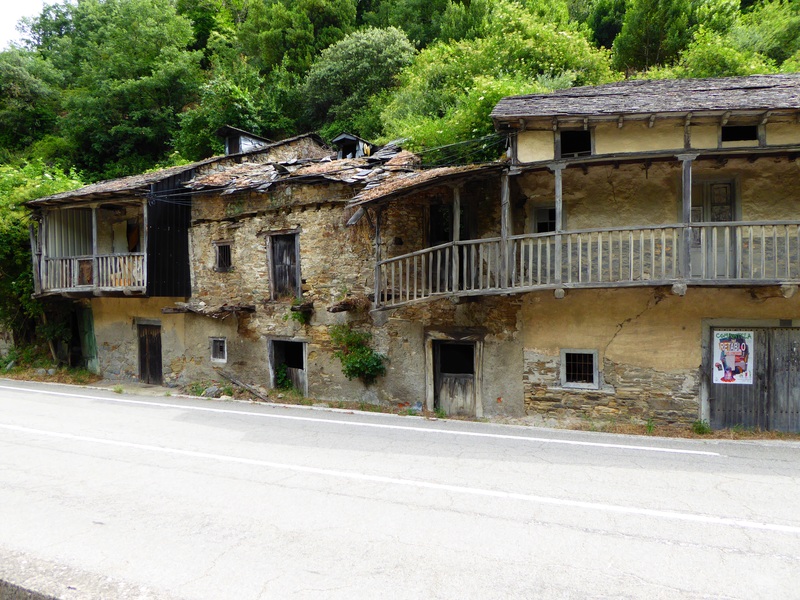 While this is so typical of the decay we have seen across northern Spain, it is everywhere in this particular region and from what we have read, it will continue and worsen as we enter Galicia. 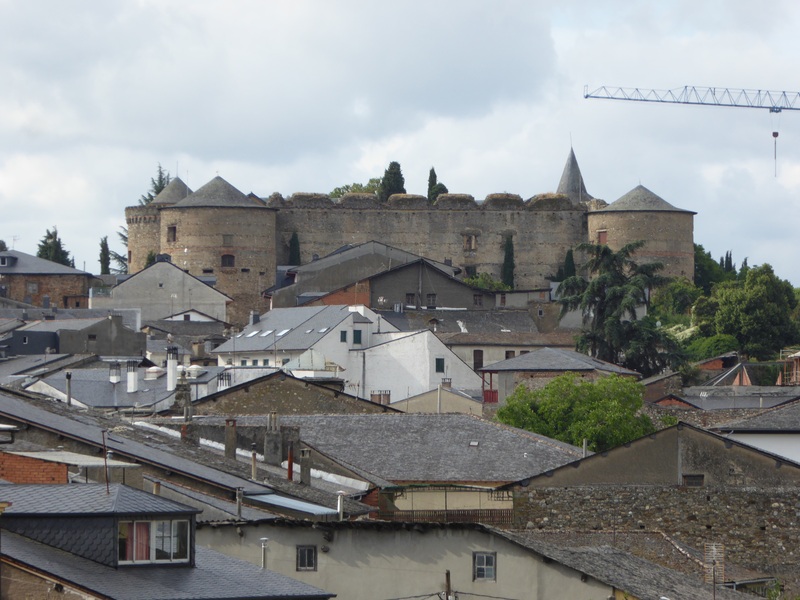 Now surrounded by slate roofed houses, this shows the size of the medieval Templar castle in Villafranca. The location of this fortress was strategically important, the next day’s journey took us through a very narrow canyon where pilgrims were protected by the Templar knights from all the bad guys along the way. Two pilgrims , one kind of stony faced, the other very beautiful. 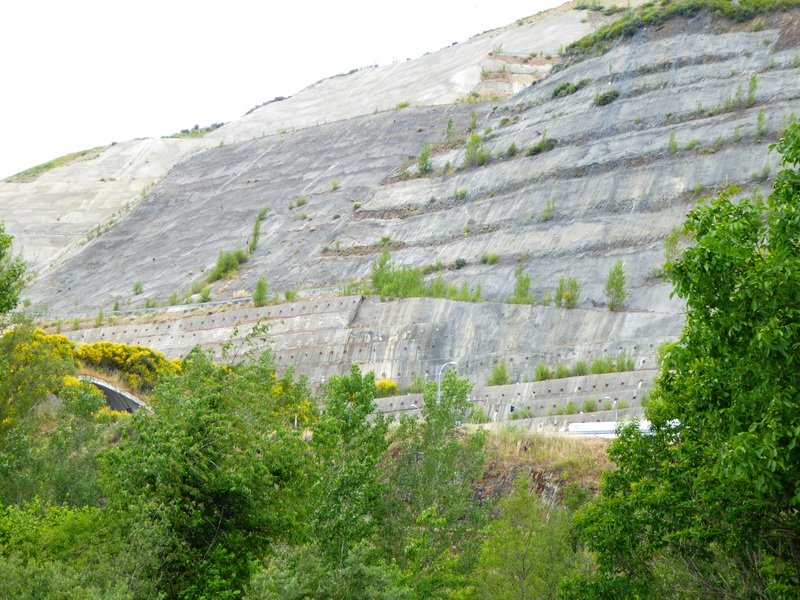 Thought there no better way to show how steep the sides of the gorge leading into Galicia that to show this picture. To put the picture into perspective, that white object in the bottom right is a double trailer transport travelling on the main east west trans Spain highway. Those are cement covered sidehills!